The Ask: Research and generate a digital roadmap for a platform to support student athletes. Outline the user experience and oversee the design of the website. It’s a rewarding experience when thoughtful design meets an altruistic vision, and this was the case with the start-up Blueprint for Success. The founder, Seneca Blue, had years of experience helping high-school and college athletes to development and showcase themselves through programs to guide them towards their full potential. Seneca recognized an opportunity to change the lives of young adults who are often underserved and lack the skills to get to the next level in athletics and academics. He has a lofty vision of creating an online platform that could share his training and inspire young adults across the nation. His relentless hustle formed many relationships with influential people who offered to help Seneca by providing mentorship and content for the Blueprint for Success platform. Research & Digital Strategy: The platform serves multiple stakeholders including students, parents, coaches and teachers. Taking a student centered approach, it was critical that I survey and interview a range of high-school and college-bound athletes to understand their digital behaviors and drivers during this stage of life. 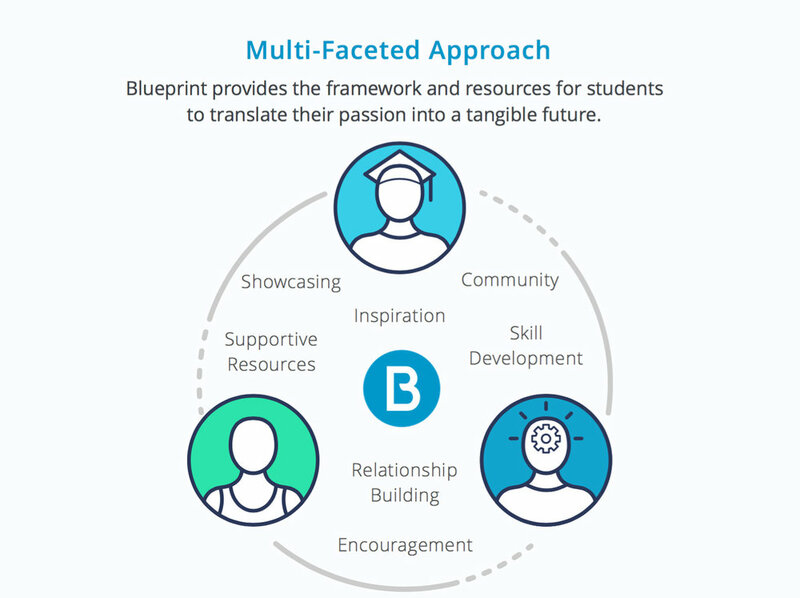 I conducted school visits to meet with athletic directors and social media administrators to see where Blueprint could add value in their systems. The vision for a holistic platform that developed teenagers as students, athletes and leaders came together in a website that included robust profiles, training modules, and rich content from big names. This digital platform had to incentivize teenagers (whose attention is pulled between multiple social networks) to invest in themselves with courses and activities that guide them towards a better future. UX: The UX created navigation models and Seneca selected an editorial, content focused experience as the desired direction. The site aggregates articles written by industry leaders who aspire to provide value and mentorship to young adults. Understanding the digital behaviors of the primary users (teenagers), the UX took a mobile first approach to create an app like experience. The profile creation and onboarding had to feel personalized and encourage students to showcase their potential for coaches and mentors. The digital roadmap accounts for courses and recognition features which will help in developing student athletes as they mature into adults. The UX provided detailed process flows and wireframes to account for this robust feature set. In parallel with the user-experience design and overseeing the visual design, I helped Seneca to visualize Blueprint for Success by creating pitch decks to share with potential investors. He was successfully funded and Blueprint for Success will soon launch the beta website for students and mentors.